Andries Verder (left) and James Song. 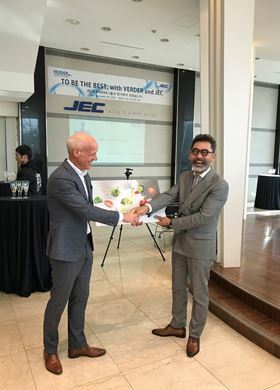 The Verder Group has bought JEC Ltd, a South Korean manufacturer of hygienic rotary lobe, centrifugal and twin-screw pumps and blending systems. Founded in 1990, JEC serves the food, pharmaceutical and other hygienic markets. The company employs more than 40 people and has an extensive distribution network worldwide. JEC director James Song will stay involved in the management of the company under Verder ownership. The acquisition of JEC will strengthen Verder’s hygienic position in the pharmaceutical and food & beverage markets. The Verder Group is a Dutch family-owned business specializing in the manufacture and distribution of pumps and laboratory equipment. Founded by André Verder in 1959 as a trading company, today the Verder Group employs 1700 people worldwide and has two divisions: Verder Liquids (industrial pumps) and Verder Scientific (laboratory equipment). The company has its own sales offices in 27 countries and several manufacturing sites worldwide.